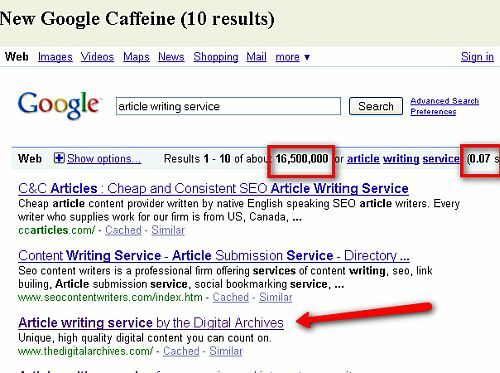 Heard the news about the new Google search engine, called Google Caffeine? So the new Google will be faster and more accurate. Faster is easier to explain. Basically performing a search will be quicker. 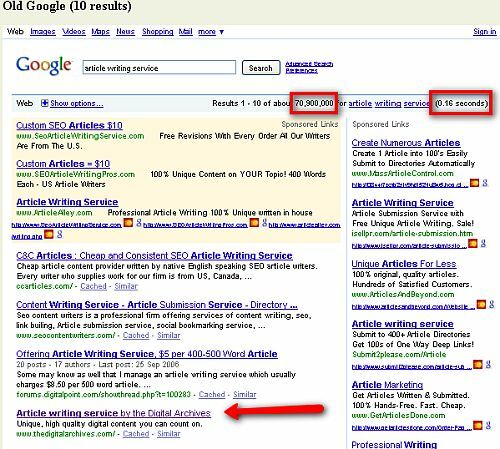 The number of sites that Google says are using the same keyword phrase will be more accurate? The websites in the top 10 returns will be more accurate? 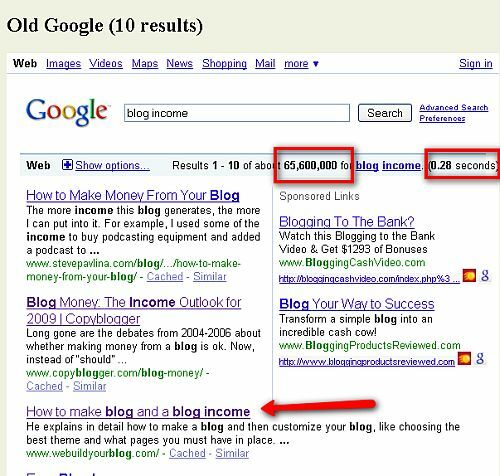 So no difference to my position but you can see there is a marked difference in the number of sites that Google thinks uses the phrase “blog income” and it was almost 66% faster. Back on 5 August, WeBuildYourBlog.com was in position 5 for the phrase “blog income”, so my backlink strategy is working. Again, notice the difference is speed of return of the results. So, just a quick comparison and the sites and keyword phrases I checked are no worse off and one was actually better. I’m sure there are many more changes to be applied before Google Caffeine becomes the new Google standard but at least they are being upfront and telling us about their plans. Is It Just a BIG Lie? Firstly, congratulation on the fantastic rankings! You obviously know what youre doing 🙂 I also saw a few results change with regards to my rankings after Google Caffeine was released…some sites went up the rankings, others moved down but the majority stayed the same thankfully! .-= Baz @ Harry Potter Halloween Costume´s last blog ..About Us =-. Most of mine stayed the smae as well. .-= andrew @ Blogging Guide´s last blog ..How You Can Win $6921 In Prizes When Two Social Media Business Players Get Together =-. I’ve not seen any difference in my search rankings for certain phrases. .-= Andrew @ Blogging Guide´s last blog ..Is The Internet Making Us Less Sociable =-. Your an Amazing person. I think, I want to know more about you. 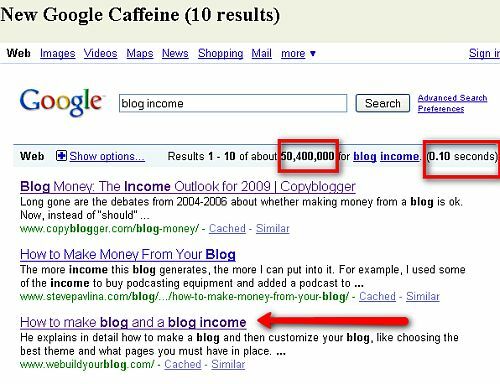 I like to apply those tips, specially the Google Caffeine to rank my sites. I guess that at the end of the day it is about writing content that Google users will apreciate and will make them keep using Google. To ensure this, it seems that in the last updates, Google is ranking better my posts whenever I have over 700 words of content. Over 700 words – that’s quite interesting. How do you know? No body knows for sure what Google is looking for.You never be exactly right with the confusing algorithms, designed such that scamers and geniuses will have a hard time keeping up. Do it this way today but don’t think it holds good for tomorrow. Sandbox me but you seemingly in similar position to receive the same treatment, is never ever touched. I say go with the flow, Google is boss, we all know that, they are search engine monarch, if they are right they are right, if they are wrong they are still right. To remain in the game you must play by their rule as least for now. I agree…no one really knows. We can only interpret what they officially release. Didn’t hear about Google Caffeine until now but I do spend a decent amount of time on the internet 🙂 whenever I can. Google is undoubtedly the top search engine, for everything we need to know there is Google to make things easier. Its good to see Google introducing new updates like the algorithm. Thanks for sharing information on Google Caffeine, feels more well informed. Google are always changing their algorithm. The big recent one was the Panda change. Andrew recently posted..Escaping The 9-5: Do You Miss This?